My patient was dying and his family was terrified. Riddled with abdominal tumors and engorged gastric blood vessels, Mr. G, a 54 year old Korean man with advanced hepatitis B-related liver cancer would not survive this hospitalization. For weeks, he had suffered from progressive abdominal pain and distention, and had recently lost his desire for food and the ability to take anything by mouth. He had difficulty swallowing anything, and he felt like his abdomen was going to explode when he tried. His large extended family, his wife in particular, was preoccupied with feeding him. On admission to the hospital she requested placement of a tube or an IV to deliver nutrition since he was no longer eating. She was adamant that we intervene soon, since it was clear to them that he was deteriorating and didn’t have much time. It was hard enough to watch him grow sicker with cancer, but they were not willing to watch him starve to death. But, of course, he wasn’t actually starving to death. He was dying of cancer. Anorexia at the end of life can be one of the most agonizing parts of the dying process for families to cope with. As one of the palliative medicine fellows at UCSF, I am part of a consult service that is often called upon to help other doctors navigate the discussion around artificial nutrition at the end of life. Despite an awareness of what the medical literature tells us about the risks and benefits of these interventions, I struggle with how tough it is to counsel and guide grief stricken families through these complex decisions. Is it ethically right to subject a dying patient to the surgical placement of a feeding tube when you feel strongly there is no benefit to be gained? What if if the family insists? Even within the team of providers, there isn't always agreement. My attending felt that the moral distress of the family was so grave that perhaps feeding tube placement might be reasonable as a way to give them peace and avoid conflict. But this patient was at the very end of his life, and I was not convinced. I listened to their concerns and assessed their understanding of his disease (they knew he was dying) before presenting them with information on what we know about artificial nutrition in patients with advanced cancer. I emphasized that there is no evidence it improves survival, quality of life, nutritional or functional status and may in fact hasten death, if long term complications arise as they do 32-70% of the time. 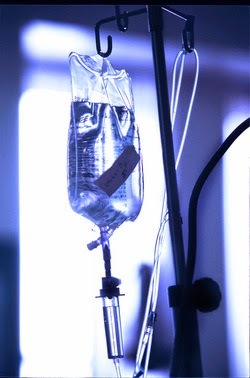 Both tube feeds and TPN can contribute to patient discomfort, decreased mobility and the possible need for restraints. There is evidence that surrogate decision makers tend to overestimate the benefits while underestimating the risks of artificial nutrition. In one study the majority of patients had no improvement in quality of life after feeding tube placement according to caregiver report. In another study, physicians assessed that artificial nutrition was very unlikely to improve quality of life in cancer patients who survived 3 months or less. While Mrs. G seemed interested in the information I offered, she continued to demand that we intervene. The patient, depressed and scared, was not interested in weighing in on the decision and looked to his wife to advocate for him. My recommendation that we focus on comfort instead of pursuing artificial nutrition given the risks and benefits was not enough to convince her that it was not starvation that was killing her husband. She explained to me that food was the center of the their most celebrated ritual -- a weekly gathering of extended family for Sunday night dinner -- and the thought of him dying with an empty stomach was almost as distressing as his death itself. Of course people are tortured by the concept of “starvation” of their dying loved one; food is the basis of life and defines how we show love for each other. But when a dying person can no longer eat, families can be counseled that showing love in other ways -- like respecting the bodies rejection of food, is possible and essential. I explained that artificial nutrition is not food, but rather an industry manufactured mixture of carbohydrates, protein and lipids. In patients whose bodies were close to dying from advanced cancer, food becomes unhelpful and unnecessary. Artificial nutrition, simply put, is not food. The loss of appetite and the catabolic state that can accompany advanced illness is natural part of the dying process -- and in fact it can even have benefits. The ketotic state generated by the reduction of readily available calories can itself produce a sense of euphoria and is thought to be an endogenous mechanism to ease suffering when we need it the most. In Jessica Zitter’s recent NYTimes Well Blog entry, she offers a different perspective on the feeding of our loved ones at the end of life, one couched in the natural history of humanity and bedside caregiving. She writes that for thousands of years, people have hand fed their dying loved ones until their bodies were unable to take more. In our data-driven approach to complex decision making, this refreshingly simple and rational perspective was helpful in my own approach to this issue. The image of directly hand-feeding our sick loved ones until their bodies aren’t able to eat any more is powerful and timeless. It comes from a basic nurturing instinct of our collective existence, one without G-tubes and PICC lines. It is a comforting reminder that death is as old as humanity and since the beginning of time no human soul has escaped its inevitability. Mr. G died peacefully and comfortably in the hospital before any final decision regarding artificial nutrition was made. In his final days he had a few sips of water but remained unable to swallow much else. While it was not the outcome anyone had ever wished for him, I’m certain that we did him and his family a service by engaging them in a prolonged discussion about artificial nutrition over several days rather than immediately subjecting him to a futile procedure. Of course, it would have been simpler to feed him artificially. While the fee-for-service, time-crunched medical world we operate in certainly would have favored a more interventional approach over the hours spent talking with the family, it would have undoubtedly been of little benefit -- and possibly caused harm -- to our dying patient. 1 ) Cervo FA, Bryan L, Farber S. To PEG or not to PEG: a review of evidence for placing feeding tubes in advanced dementia and the decision-making process. Geriatrics. 2006;61(6):30–35. 2) Mitchell SL, Berkowitz RE, Lawson FM, Lipsitz LA. A cross-national survey of tube-feeding decisions in cognitively impaired older persons.J Am Geriatr Soc. 2000;48(4):391–397. This is such a thoughtful and sensitive discussion of an very challenging and common scenario. "I’m certain that we did him and his family a service by engaging them in a prolonged discussion about artificial nutrition over several days rather than immediately subjecting him to a futile procedure." While it was clear that a feeding tube would not have medically benefited the patient, I am concerned for the family and how they may interpret the patient's death. Is there any reason to believe that this patient's wife is not now convinced that he died from starvation and that the care team simply ignored her request for enteral feeding? There are values expressed in these conversations and decisions that go beyond the medical benefits and burdens. Especially in this case, where the severity of the patient's illness and his symptoms prevented using attentive hand feeding. Not sure exactly what my point is, but did want to share this response. Daniel, I understand your point, which is did we benefit the family's grief and bereavement by withholding and not placing a feeding tube, even though the benefits would have been negligible? Or would the family's grief and bereavement have been better had a tube been placed? I always tell students and residents that once we know the patient is dying and were assured of their comfort, we need to shift a major part of our effort to trying to make the grief and bereavement of surviving family members the best that it can be, and sometimes this may include placing a feeding tube. Thank you Paul - you articulated my concern very accurately! Excellent point about prioritizing the patient's comfort and then being able to attend to family grief and bereavement.